Kids stock up their pretend kitchen! Dish rack measures 9-5/8" x 7-1/2"
Jumbo Kitchen Set. 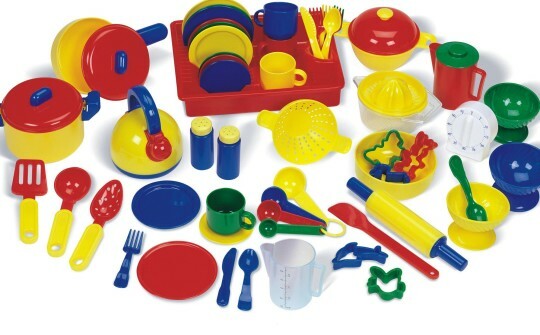 Includes 76 sturdy plastic items: pots, pans, cups, dishes, utensils, tea kettle, roller, juicer, cookie cutters, strainer, pitcher, timer and more. Dish rack measures 9-5/8" x 7-1/2". Ages 3+. Yes I would buy this product again. I am using this product in my 3 to 4-year-old classrooms at my church. Works great with the kitchen set I already had. Tried this with Memory Care Residents to difficult for them but a grandchild was visiting and loved this Set! Students really enjoy this activity. I had a majority of males unusal and needed male orientated project. This was fun but did require one on one attention in memory care. Colorful and engaging with help.